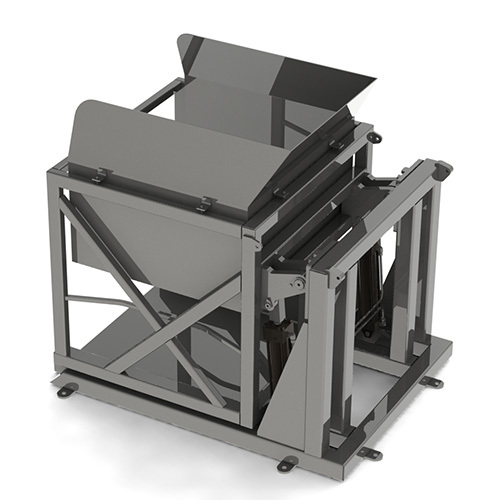 Features and benefits:Built for endurance and powered by hydraulics for a smooth and uniform operation, the Combo/Tote Tilt Dumper has been designed for emptying vats, totes, and combo boxes and has been produced and constructed from 300 series stainless steel with AMI’s Sanitation Equipment Design Principles and ease of cleaning in mind. . The Combo/Tote Tilt Dumper comes with a 1-year hydraulic cylinder warranty and 3-year structural warranty. Construction: Features include 3,000 lb. 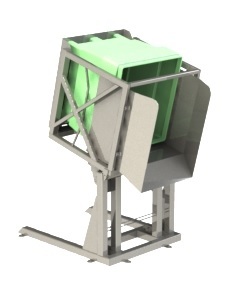 weight limit with lift points structured for longevity, a dump height starting at 39” up tp 60″ or anywhere in-between for your specific needs, ridged hydraulic lines, and an optional hydraulic power pack in either steel or stainless steel.Lift & tilt style for taller dumping applications available. Description: All equipment is manufactured and designed with endurance, sanitation, maintenance ease and production needs in mind. Custom Machinery, quality replacement parts, or Industrial Products. Give us a call today and work with the best.